This was my first ever walk in the Scottish hills, I am embarrassed to say I was dragged up by my wife and brother-in-law as I was more interested reading my book in front of the fire..... my attitude has changed a bit since then. This is a pleasant stroll in the Cairngorms starting from the car park on the ski road (GR986074), and then follow the path southeast to the clearly visible Chalamain Gap (GR965052). 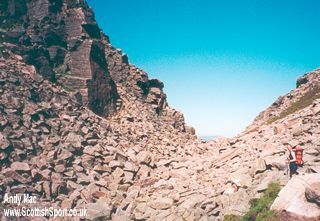 The gap is a steep sided rocky gorge, which leads into the Lairig Ghru. The echo and the huge boulders give an extra feeling of seclusion and "otherworldliness" even though it is only 3 km from the start car park. This is an easy wander, the gradient is gentle, the path is clearly marked and the destination is worth going to. This is a great afternoon giving a taste of the Cairngorms without leaving you hobbling to your work for most of the next week. After all, Aviemore will still be there to visit the next time.